What is the Paediatric Continence Forum? The Paediatric Continence Forum (PCF) is an independent national campaign group which was set up in 2003 to improve government awareness of the needs of children and young people with continence problems – and to improve NHS services in this often neglected area of child health. Its membership comprises key paediatricians and specialist nurses in this field, with formal representation from the charity ERIC (The Children’s Bowel and Bladder Charity), Bladder and Bowel UK (formerly PromoCon), the Royal College of Paediatrics and Child Health (RCPCH), the Royal College of Nursing (RCN) and the School and Public Health Nurses Association (SAPHNA). The PCF has five commercial members who support its work. These are: Coloplast UK Ltd, Ferring Pharmaceuticals Ltd, Kimberly-Clark Europe Ltd, Norgine Pharmaceuticals Ltd and Essity (formerly SCA Hygiene Products Ltd). You can find more about our commercial partners here. There are about 900,000 children and young people (aged 5-19 years) in the UK with a continence problem. This may be bedwetting, daytime urinary incontinence, constipation/faecal incontinence (bladder and bowel problems) or a combination of these. This figure is likely to be an underestimate due to under-reporting and the stigma associated with these conditions. Continence difficulties often occur at a sensitive time in a child’s emotional and physical development and can cause feelings of low self-esteem and social isolation. They also contribute to family stress and to the very real risk of bullying by siblings and peers. These in turn can prevent children and young people from taking full advantage of social and educational opportunities at school. Such conditions are treatable, yet community-based NHS treatment services vary hugely across the country. Not all provide an integrated service that treats all conditions under one roof, which results in families having to travel to different clinics and see different advisers. This compromises treatment outcomes and costs the NHS unnecessary additional money. Research into the 235 health commissioning bodies across the UK carried out by the PCF in 2017, building on previous research conducted in 2011 and 2014, confirmed a fragmented picture. Overall, only 41.13% of CCGs and Health Boards provided all four paediatric continence services and product provision, while only 30.74% commission these in an integrated manner. Moreover, only 22.94% were led by a specialist paediatric continence adviser. See below for a breakdown of the results for each of the four nations in the UK. Since 2015, the PCF has noted concerns around the withdrawal of continence from the remit of school nurses in England, following the transfer of the school nursing services from national government to local authority control. School nurses previously provided vital first line advice, information and treatment to children, young people and their families on bedwetting, constipation/soiling and toilet training problems. School nurses can identify and manage problems before they became serious and refer children with more complex conditions for a more specialist assessment (for example, to the Level 2 Community Paediatric Continence Service). The result is that many children with continence problems who could easily be treated in the community are now being referred to secondary and tertiary care. This has significant cost implications for the NHS and is a pathway that delivers poorer outcomes for the patient. It seems to be a particular problem in areas where a proper Level 2 continence service is not in place. The PCF also understands that school nurses are experiencing difficulties in treating children with continence problems in Northern Ireland, Scotland and Wales too. Further information on the changes to school nursing, and what the PCF has been doing in reaction to these, can be found here. What is the PCF working towards? The PCF advocates prevention, early detection and effective intervention. Well-planned and integrated community-based services are key to meeting children’s continence needs. Early identification and effective treatment saves children from unnecessary emotional distress, improves clinical outcomes and provides significant long-term savings for the NHS. has effective referral and care pathways to; (further) medical assessment as needed, intervention at primary and secondary care level and to education and social services (NICE 2010 Paediatric Continence Service Commissioning Guide). The above is outlined more fully in the NICE-accredited Paediatric Continence Commissioning Guide, published by the PCF in 2014 and updated in October 2015. This is a practical tool to aid the commissioning process. It can be found here. How does the PCF achieve its aims? The PCF’s full set of aims are set out in our Strategic Plan for 2017-2021, which can be accessed here. How we achieve these aims is addressed in our Activity Plan for 2018, which outlines our objectives of increasing the PCF’s profile within the health and children’s sectors; increasing the parliamentary profile of children’s continence and the work of the PCF; and developing the role of the PCF as a policy leader in delivering policy change. 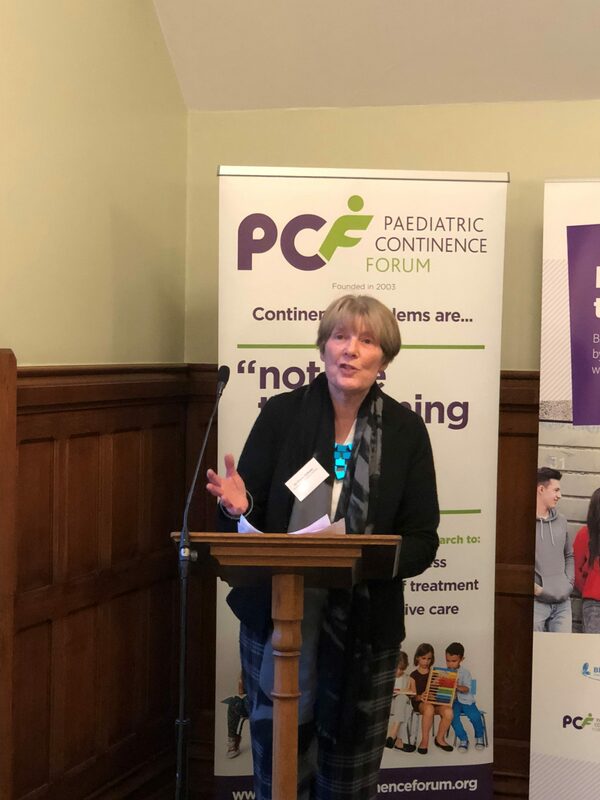 To deliver these aims and objectives the PCF engages with parliamentarians, NHS England, Public Health England and national healthcare organisations to raise awareness of the needs of this group of children and young people, and the need to improve the quality of paediatric continence services. The PCF also responds to consultations, liaises with the Royal Colleges and contributes to the All-Party Parliamentary Group on Continence Care as a means to actively contribute to policies, clinical guidance and Government reports.